About a year ago a friend of mine asked if I would like to start a worm compost (vermicompost) in my basement. At first I was reluctant because… worms in my basement. But since I am an avid vegetable gardener who uses compost, the idea of making it myself was appealing. Worm composting is not nearly as difficult or time consuming as one may think – and the result… well, just wait until you see this year’s seedlings! In it’s simplest form, vermicomposting or worm composting, transforms food waste into nutrient-rich compost using worms (in particular, red wigglers). 1) No. Worm composting does not smell. 2) No. You do not have to touch the worms if you do not want to. 1. Container: Doreen started me off with a plastic container that was about eight inches high. She had drilled holes in the bottom for ventilation and raised the bin on bricks to let excess liquid run out. She then put a tray underneath to capture the liquid, which you can use for fertilizer (think of it as high octane fertilizer!). The container also had a tight lid to not only keep light out, but also keep the worms in. 2. Bedding: We then filled the bin three-quarters full with finely shredded newspaper, broken up eggshells and a bit of soil. We then moistened this with a bit of water and mixed it all up loosely to allow for good air flow. 3. Worms: Doreen then dumped in about a pound of red wriggler worms. Red wrigglers are low maintenance forgiving and like to eat! So, no, you do not use earthworms for composting purposes. 4. Where to keep your worm bin: I keep my bin in my unfinished basement, where it is cool, not cold and not too warm either. It is also not in direct sunlight (worms hate direct light). 5. 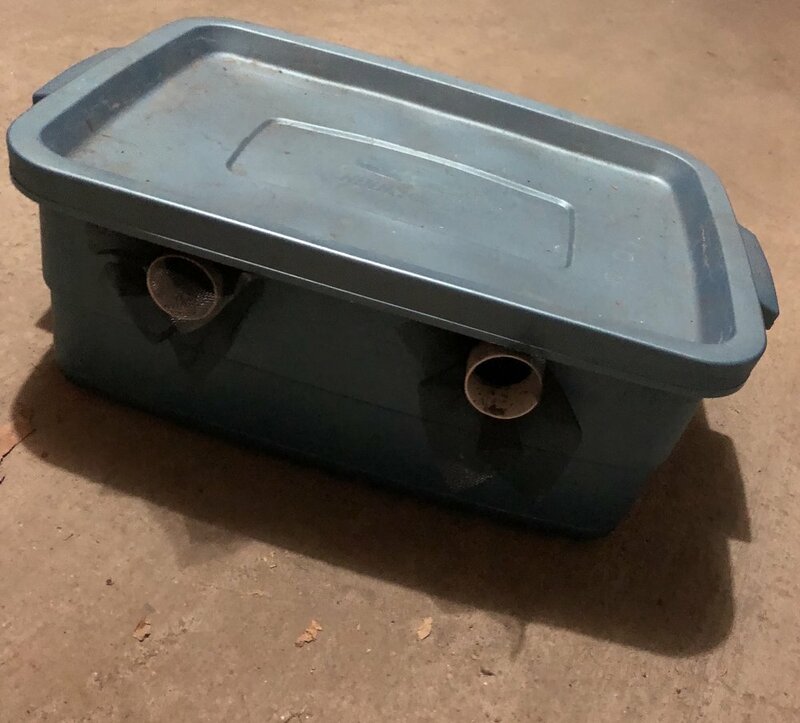 Feeding and caring for your worms: I keep a compost container on my kitchen counter (as well as a larger one under my sink). When it is full, I “feed it to the worms,” which is about once a week. I simply go down, open the lid, pick a corner, dig a little hole, dump the food waste, cover it up and go. Admittedly, I also love looking around to see how the worms are doing. I look for eggs (they’re usually in avocado shells) and worm clusters (this way I can tell what they really like to eat). Note: I leave a little marker of some kind (a lid or something small) that I place on top of the corner that is next for me to put food in. This way the food is evenly distributed. If the bin starts to give off an unpleasant odour or if your worms are trying to escape (you will see lots on the lid), the bedding may be too wet. Stop feeding them until the worms catch up and gently stir the contents to increase airflow. Weeks later the compost is looking good! 6. When and how to use your compost: In a couple of months you will start to see all the paper and dirt turn into compost. It’s quite miraculous, really. You can then mix your worm compost with potting soil for potted plants, add it to your garden soil, and use it when transplanting seedling from indoors to outdoors for a little extra nutrients to ease the stress of the climate change. I now have both an indoor and outdoor worm compost. I upgraded my indoor worm compost to a Worm Factory because my worms outgrew my starter bin, and my husband built our outside worm compost. I dump food in our outdoor worm compost all year long (of course, it doesn’t break down in the winter, but come spring – it breaks down really fast!). And no, our outdoor compost bin does not smell! The worms do a great job of breaking down the enzymes responsible for odours and if it does start to smell, I just go in with a pitch fork and mix up the compost to allow for more air to get in. Can I move my outdoor worms inside and vice versa? Yes, when it is time to bring your worms inside, you can spread out the compost on a tarp on a sunny day and move it around until you see the worms scramble to find darkness. Take those worms and put them in an inside worm compost (you can start your indoor compost again, starting with step one). We did this last fall when it was time for our indoor worms that we put outside for the summer to come back inside. This year I think we will continue to have an outdoor and indoor compost. As I mentioned my friend, Doreen, owns Smart As Poop, a vermicomposting business that introduces the process to classrooms. She introduces the magical world of worms (red wigglers) in a creative, fun and educational way that not only teaches children how composting works, but also what happens to their food – from seed to soil! 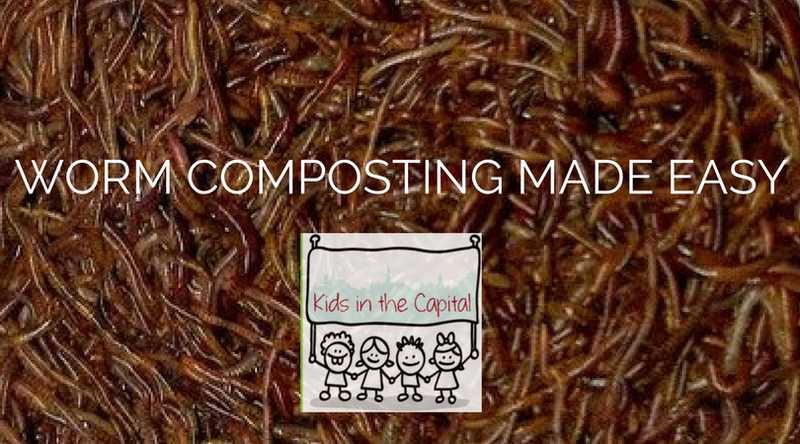 Worm composting at home is just as fun and educational. A part of my daughter’s chores involves feeding the worms and giving me a status check, which is usually a “they’re fine” or “one was on the lid, but I just put it back in.” She has also learned the ins and outs of composting – a skill I hope she will come to appreciate as an adult. If you’re not convinced that vermiculture is for you, just remember that worm composting reduces your garbage and your reliance on city composting. There is also something gratifying about managing your own organic waste, making your own compost and watching your worms grow and multiply. Honestly though – it’s fun! If you would like more information on vermicomposting, check out Smart As Poop. 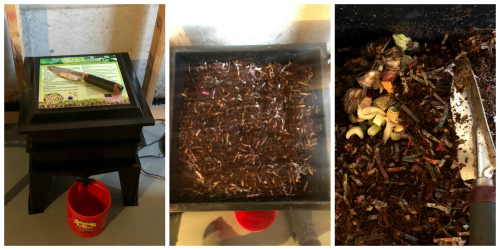 You will find valuable information as well as all the equipment you need to get started with your very own vermicompost - for yourself or a school classroom! A couple of years ago, after seeing a pattern in the kinds of vegetables my family and I like to grow in our vegetable garden, I decided to look into seed saving to see if I could reuse various seeds from our family's homegrown favourites. When I started seed saving, I wasn’t sure what I had to do before preserving them or if I could just through them in a Ziplock bag (or the freezer) and forget about them until spring. Luckily, there are resources dedicated to teaching keen gardeners how to preserve their seeds so they can use them again. USC Canada is an organization dedicated to the preservation of seeds as well as the sale and consumption of good (ecological) seeds—non GMO seeds, and non hybridized seeds that still maintain their flavour and nutrients. USC Canada has a handy seed saving document that not only details seed harvesting information, but also information on how to clean the seeds as well as how long the seeds will maintain their viability. For example, did you know you can store carrot seeds for three years and tomato for five years? Seed saving is not difficult or time consuming. Once you have mastered it, saving seeds will save you money (and the time it takes to remember to order or go to the store and purchase them every spring). The procedure to save seeds depends on the type of fruit or vegetable, but, for example the tomato – if you are like me you probably have an over abundance of tomatoes at the end of the growing season. Well, take one or two of your overripe, soft tomatoes and scrape out the jelly with seeds into a jar and cover with water. Leave it to ferment for three or four days (or until it gets mouldy). Then decant with new water and throw away any floating seeds – only keeping the ones that did not float. Then spread them on a paper towel and let them dry out for about a week. 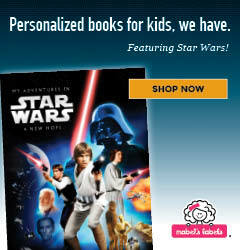 Then put them in a paper bag or envelope and store them for up to 5 years! The key is to make sure your seeds are completely dried out before storing them. In addition to saving money, by saving seeds you are helping to preserve the genetic diversity of fruits and vegetables. By saving seeds from fruits and vegetables that grow well and eventually building up enough stock to rotate what you grow in your garden every year, you are helping to maintain genetic seed diversity and keep various species of fruit and vegetable plants alive and well. Getting your children involved is a great way to get them interested in the environment, food, and sustainability. It's also a great way to show children where their food came from, and how they can produce it themselves (and keep producing it). Younger children love to get their hands dirty! Let them help harvest the seeds from the chosen fruits and vegetables. You can also throw in some math lessons by having them help count the seeds. Seed saving and recycling makes for a great science experiment for kids of any age and, regardless of how old you are, if you like gardening there is always a sense of pride and satisfaction when the first sprouts breaks out of the seed and dirt to say hello. For more information on seed saving, as well as "good" seed companies (I buy mine from Cubit's Seed Co.), visit USC Canada. Do you save seeds? From what fruits and vegetables? Leave a comment and let us know. Gardening can sometimes seem daunting, and just a teeny bit terrifying. I'm here to tell you that it doesn't have to be that way! We make it more complicated than it has to be. If you have a little patch of dirt that you've been eyeing, then now is the time to sow your seeds (or plants!) and get started! I'd like to share some answers to commonly asked questions we get about our vegetable gardens. Yes, our gardens are quite large, and we grow a lot of stuff. But you don't HAVE to start out big, and in fact, a small garden may be just what your family needs. And if you happen to catch the veggie gardening bug, well then I've done something good in this world after all. We live in Ottawa, land of the cold, so early June is definitely not too late! It's true that some plants do well in colder temperatures (fragile greens tend to wilt in the heat,) but many plants are happy to bask in the sunshine. We're still planting seeds now, and will be putting in our seedlings (baby plants) this weekend. Start by thinking about the three things your plants need - soil, water and sunshine. First, assess the location of your patch. Is it in full sun all day, or partial shade? That will help determine which vegetables you should choose. If you are REALLY starting from the beginning (i.e. you want to dig up some grass to actually get to the dirt,) I would suggest this really cool method to save yourself back-breaking work of grass removal. This is also a great way to kill weeds if you don't feel like pulling them. This next step isn't necessary, but you may want to consider getting a bit of compost to mix in with your soil. And remember to use your grass clippings, leaves and food scraps (no meat or fat) to feed your garden. Finally, you'll need a source of water nearby (duh) Hopefully you have a hose, or are willing to lug some buckets when needed! You really don't need much. A nice pair of gardening gloves will save your hands, a good shovel and trowel. As for whether you should start from seed or buy the baby plants, that's totally up to you. If you're reading this now and have decided to start right away, you will probably want to head to a garden centre and get some seedlings. That said, I'm still throwing seeds around like nobody's business! We have sadly failed at growing seeds in our home...it's a tricky business, but I'm hoping some day we will get the hang of it! This is entirely up to you and your patch location! Most veggies do well in full sun. Start with some simple things - herbs, radishes, and kale are three that I find grow easily and seem pretty pest resistant. Cherry tomatoes are great for kids! A note that squash and zucchini will take over your garden because they are GIANT plants. Think about the vegetables your family likes to consume on a regular basis, and choose from that list. Remember, though, that some of the vegetables we buy are trucked in from much warmer climates and may not grow well here. What if I kill my plants? Gardening is fun and exciting, and part of that comes from never knowing what you're going to get! Will something fail miserably this year? Will you run into a pesky beetle that kills all your cucumbers? Will the one veggie you thought would not work suddenly win the race? Year after year we make notes of what worked and what didn't. A "green thumb" is something that you develop over time, but even experienced gardeners can't control the environment. So don't worry about killing anything, and just have fun with it! Finally, make sure to involve the kiddos. Probably too obvious to say, but kids LOVE gardening. Who doesn't like getting dirty, spraying hoses and pulling stuff out of the dirt? Also, veggie gardens are a sneaky way to get your kids to eat their vegetables. Ever since they could eat solids, my babies have been pulling stuff out of our gardens as snacks. They are now quite adventurous when it comes to trying new vegetables! Do you have a veggie garden? What made you want to start growing your own food? I won't be playing practical jokes. I probably won't be planning Easter crafts. I definitely won't be spring cleaning! Here in Ottawa there is a by-law in place to prevent urban/suburban dwellers from owning and raising chickens. If you're anything like me - suburb born and raised - you probably don't know the first thing about chickens. But we all know about EGGS. Delicious, versatile eggs. My go-to meals during the week if we're rushed are quiche, frittata or omlette. And don't forget Sunday breakfasts of fried or scrambled eggs, bacon and toast. As a family, we go through a lot of eggs! We're lucky to have a big backyard, and our vegetable patch has grown considerably since we moved here 3 years ago. But I still dream of a little chicken coop out in the back corner by the fence, where my 3 little hens lay their eggs every day. Some Ottawans are fighting to have the by-law changed, but while I wait for the chicken politics to play out, I must find my farm fresh eggs elsewhere. If you've never tried an egg from a chicken raised in its natural environment (space to move, preen and roost), you're definitely missing out! I swear I can taste the difference from the eggs we used to buy in the grocery store.